Ubisoft has unveiled a new site and video trailer for the upcoming “Assassin’s Creed: Chronicles” trilogy, with the first instalment “China” to be released April 22nd on the PlayStation 4, Xbox One and Steam. The trilogy spawns from the DLC previously available with “Assassin’s Creed: Unity” on next gen consoles through season pass. “China” was part of this, alongside “Dead Kings”, while chapters “India” and “Russia” are shiny and new. The games come in 2.5D form, incorporating many of the abilities and features of the previous games into a new art style. Each chapter also claims to be stand alone in the storyline, a “new beginning” coming with a “unique hero from the Assassin’s Creed universe in a never-seen-before setting.” Fans of the previous characters need not be dismayed however, as Ubisoft also claim that old friends will appear in the series. “Chronicles: China” is focused on the story of Shao Jun, the last remaining Chinese assassin, as she attempts to restore her fallen brotherhood. This character is not as new to the scene as you think however, as she was first introduced in the short film “Assassin’s Creed: Embers” in which she was trained by Ezio Auditore. 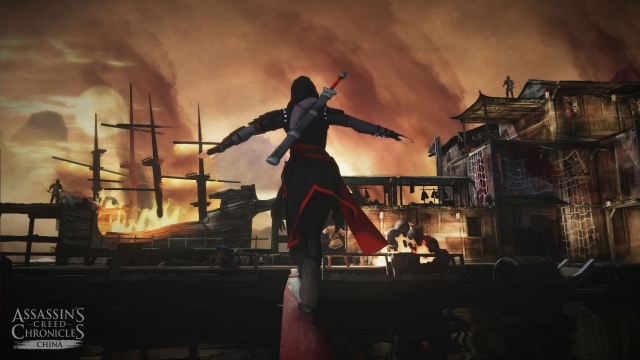 These alternate chapters of the Assassin’s Creed series come in the wake of Rogue (360, PS3) and Unity (XB One, PS4, PC), of which whilst popular in sales met mixed reviews. Unity in particular was subject to criticism due to the numerous glitches in the game upon release, and the lack of female playable characters (which some believe Chronicles attempts to compensate for). The pre-order for “Assassin’s Creed: Chronicles – China” opened today on PS4, XB One and Steam.